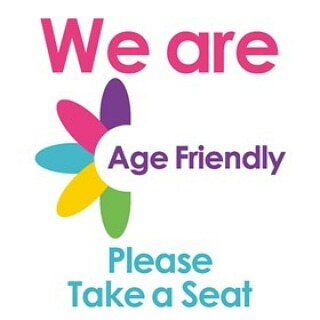 Age Friendly Nottinghamshire’s ‘Take a Seat’ initiative wants more shops, businesses and meeting places to have a seat available in case an older person needs to catch their breath and rest while they’re out shopping. The scheme aims to raise awareness of how older people sometimes struggle to access their local area because there isn’t enough seating available for them to rest. Advice is also provided on how to make premises more age friendly in other ways, such as making sure the floor is level and clutter free to prevent trips and slips, lighting is clear and bright, steps have a handrail, products on shelves are within easy reach, toilets are provided where possible and that any music is played at a moderate level. A ‘We are Age Friendly’ sticker will be displayed in all shops and premises taking part in the initiative. The sticker will reassure older shoppers that they will be given a warm welcome and offered a chair to have a sit and rest. Stapleford Independent Councillor Richard MacRae has been out on the High Street talking to businesses about the importance of becoming Age Friendly and signed up many businesses who jumped at the chance to take part in this scheme. A third of older people are identified as lonely. Sadly, many become isolated because they find it increasingly difficult to walk from their homes to local shops and community venues. A lack of seating for them to rest when out can be a significant barrier to them leaving their home. Loneliness can also lead to depression and mental decline.